The Department for Management Strategy, Policy and Compliance (DMSPC) is responsible for enforcing United Nations policies on conduct in peacekeeping missions and special political missions. In this regard, DMSPC works closely with the Department for Peace Operations and the Department for Peacebuilding and Political Affairs. The conduct and discipline function for all field missions is overseen by the Under-Secretary-General for Management Strategy, Policy and Compliance. The Administrative Law Division (ALD) of the Office for Human Resources (OHR) was formally established on 1st January 2019, following the approval by the General Assembly in its Resolution A/RES/72/266B of the UN Secretary-General management reform proposed in his Report A/72/492/Add.2 on shifting the management paradigm in the United Nations: implementing a new management architecture for improved effectiveness and strengthened accountability. ALD provides client-focused strategic, policy and legal expertise and guidance for all aspects of human resources application within the internal justice system, on behalf of the Secretary-General, and an integrated approach to the implementation of the United Nations standards of conduct for all categories of personnel serving throughout the Secretariat, including in field missions. The Conduct and Discipline Service (CDS), which is part of the Administrative Law Division, provides overall direction for conduct and discipline issues, including on combatting sexual exploitation and abuse. The scope of CDS’s work includes formulating policies, developing training and awareness raising activities and ensuring oversight of the handling of allegations of misconduct. CDS liaises with Member States on allegations of misconduct involving their uniformed personnel. CDS also advises the Under-Secretary-General for Management Strategy, Policy and Compliance on all aspects of the implementation of the three-pronged strategy of prevention, enforcement and remedial action to address misconduct. Both the Appeals and Accountability Section (AAS) and the Critical Incidents Response Service (CIRS), which are part of the ALD, handle allegations against staff members (both national and international) that have been referred to the Office of Human Resources following an investigation for misconduct. Either AAS or CIRS (if the matter involves a senior official referred to the SG) review the reports and all supporting material and advises the Assistant Secretary-General for Human Resources in deciding on whether to initiate a disciplinary process. Such disciplinary process may lead to the imposition of disciplinary measures, including dismissal, or administrative measures. AAS and CIRS also liaise with other offices and provide advice on disciplinary and related matters. Conduct and Discipline Teams (CDTs) are based in many peacekeeping missions and special political missions around the world. Some field missions have a conduct and discipline focal point. CDTs and focal points in field missions advise heads of mission on conduct and discipline issues involving all categories of personnel and address all forms of misconduct by United Nations personnel in field missions, including acts of sexual exploitation and abuse. CDTs provide training for peacekeeping personnel on UN rules and conduct, and draft and implement strategies designed to deter violations of local laws and UN rules and regulations. CDTs are also responsible for developing and implementing outreach and awareness raising activities for the host country’s population. 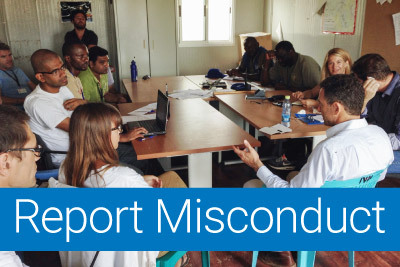 CDTs receive and assess misconduct allegations and, upon determination by the Head of Mission that an investigation is warranted, refer them to appropriate investigative authorities. CDTs also record, track and follow-up on all cases of misconduct relating to their mission. Furthermore, CDTs coordinate victim assistance for victims of sexual exploitation and abuse, together with other UN partners in the mission as well as with civil society partners. The Office of Internal Oversight Services (OIOS) is the internal, independent oversight body of the UN. The OIOS Investigations Division investigates reports of violations of United Nations regulations, rules and administrative issuances, including those occurring in field missions. CDTs are required to notify OIOS when they receive complaints involving Category 1 matters, as identified by OIOS. The Office of Legal Affairs (OLA) may become engaged when allegations of misconduct also raise issues of criminal accountability or privileges and immunities. Member States: When allegations of misconduct involve military or police personnel, the UN and the Member States must together ensure that all credible allegations are investigated and that appropriate action is taken when allegations are substantiated. Troop- and police-contributing countries are responsible for ensuring that all uniformed personnel receive pre-deployment training before their arrival in the field mission, based on core pre-deployment training materials provided by the UN. Member States must also certify that uniformed personnel that are deploying have not previously been involved in any violation of international human rights law or international humanitarian law, or previously repatriated on disciplinary grounds or otherwise barred from participation in current or future UN missions in connection with an act of serious misconduct. United Nations Development Programme: When allegations involve United Nations Volunteers (UNV), the disciplinary process is handled by the UNV programme, with legal support from the United Nations Development Programme.